Glenmorangie Signet is very different from any of its stablemates; in fact, very different from any Highland malt I've ever tasted. Some of its barley is roasted chocolate malt, which apparently gives a nutty, coffee-like aroma (which you certainly get with this one!) Some of the spirit comes from Oloroso sherry butts, and much of it is finished in charred new white American oak. There are also whiskies in here that are 35-40 years old (hence the high price tag). This sample comes to me from @misslauren - it's been open for a couple of years. The colour is a deep, almost reddish gold. The rich aroma is very unusual: dark chocolate, roasted walnuts, blood orange, buttered dark rye toast! Roasted coffee beans (but doesn't quite smell like coffee...) Dark dried fruits such as dates and raisins. Has an dark rum quality to it. Fascinating, but I found water brings out a sulphurous note. Quite meaty on the palate, with baking spices, oak and black liquorice. Very nutty - walnuts and roasted almonds - and very citrusy too, with more blood orange and lime zest. Very complex but a bit of a mishmash of flavours going on here; water helps, though, by bringing out more spices (chili, paprika). The finish has quite a bit of wood to it, with bitter chocolate and more lime. I remember liking this more than I do now - not to imply that it's not good whisky, it certainly is - but this used to be my favourite Glenmorangie. Tasting it next to the Nectar D'Or though, it doesn't quite hold up - huge complexity but many of the notes clash together, and it is a bit sulphurous. Winner of Best Highland Single Malt at the 2011 World Whiskies Awards. @talexander, I think that both of your experiences with Signet are quite valid. I find that Signet is hugely different depending upon its air exposure. There is a period after a bottle is open for awhile during which it is lush and juicy. Before that it's rather locked up. Afterward it goes more dry, austere, and bitter. During the lush period the bitterness is well-balanced and the effect is quite beautiful. Thank you - good to know my memories of it may have some validity! I am not going to write the history of Signet as many others have done so already and there isn't much left to say about the high roast chocolate malt. With that in mind lets crack on. The colour is a dark amber and the nose is wonderful. It's creamy, waves of sweet sherry, sticky dark fruits – plums, sultanas, Orange zest, dry spices, oak and tiramisu. The mouth feel is silky smooth, creamy and is rich and sweet. Chocolate, coffee, orange, vanilla. Wonderfully balanced and well put together. The finish is wonderful leaving a chocolate after taste overlaying spiced fruits and sherry. Medium long and it leaves you wanting more, much more. A cracking dram. Definitely worth buying a bottle if you can find one reasonably priced. @hunggar Thanks. Generally I write the reviews for myself as a way of reminding me what I thought of a particular bottle. Sometimes I like the back story or interesting fact about the distillery, Whisky, bottling, region, etc so expand on the topic if it tickles my fancy. The cheapest you can pick this up in the UK is £99.00 so it's a well researched purchase. It is different from a lot of other Whiskies (in a good way). Nose: One of the pleasures is the numerous changes with successive sniffs. Off a fresh pour, the very first impression is sweet dark syrup. This quickly progresses to the most pleasurable and unique scent of the experience-- it is like holding a milk chocolate (not dark) square up to your nose; and perhaps you can discern that the square is filled with soft vanilla cream. Inhaling a little more brings malty grains to the sweetness: densely moist freshly baked honey bread (or Hawaiian bread). At this point, you might pick out faint banana bread too. Later, dates become more prominent, and if you look behind this, you might get faint beer aroma: is this the stout? Faster sniffing brings tingling spices, especially the first minutes after pouring: first nutmeg, then ginger, and then clove and allspice. If you over-breathe (faster than the sweet vapors can replenish), then you can get down to a minty/zesty/pine smell-- this is what I believe some have called aftershave. (This is otherwise not a dominant part of the nose character.) To simplify all this, the best defining character is: milk-chocolate with vanilla, dried date flesh, and allspice. Palate: First contact is sour-bitter green apple skins, but this is quenched immediately in the mouth to the smoother bitterness of nutmeg. Then the nutmeg is further rounded by the smoothness of vanilla, and these two make the dominant theme-- they coat the mouth together like a latte, with a unique and pleasing creamy texture. Further development brings thickness and subtler flavors, rather like melted milk chocolate, which lasts until the finish. Finish: From milk-chocolate, back to nutmeg/vanilla; a slight alcoholic burn tells you the latte was a tad too hot. Then the smoothening component seems to come from tobacco rather than vanilla, while other sources of bitterness play: almond skins and citrus zest. Nutmeg persists. I gave a long interim following my first taste, because it was initially a letdown based on differing expectations; apparently when other people refer to "chocolate", they must mean the milk type, whereas I imagined it dark. (So far, I have only found that in the Bowmore 15 Darkest.) The Signet has to be appreciated for what it is: It provides new and subtle aromas for exploration, it makes bitter spices smooth while imparting a thick/chewy/creamy mouth-feel, and yes it evokes creamy milk chocolate. But this lily is obviously gilded; so you need to be in a mood to slow down and appreciate it. Finnish: Smoke and dryness returns, dates again. With water more smoke and a little spicier fantastic. one of my absolute favourites, beautifully rich, great depth of flavour. Its a must have. @Wills, at 11 months of the bottle open my bottle of Signet tastes just about exactly the same as my first bar sample of it. At the time of that sample I thought, "Pretty interesting, but what is all the fuss about? This is awfully expensive whisky for what it shows." Now my comment would be that the best, most thoroughly impressive flavours present themselves in the period under 11 months open. I recommend that a bottle of it be consumed within say 9 months, or strict measures taken with decanting, gases, etc. to get the maximum delicious flavours to remain longer than that. The Glenmorangie Signet really IS different from anything else currently on the market. Crazy reading this review this morning when just yesterday I was at a store in OKC that had 8 of these neatly lined up back-to-front on the shelf. I had one in my hands, but at $174 plus tax I couldn't pull the trigger without at least having tasted it. That's a large amount of dough for something I may or may not really enjoy...& for that price I want to LOVE IT. Your description of it really sounds enticing...now I semi-regret not going ahead and just taking the chance. Great review, as always! Having finally polished off the bottle, I thought that it was time to do proper, full tasting notes for the stuff. Nose: Chocolate, maltiness, light espresso, light oak, some allspice and cinnamon. Reminiscent of a Guiness. Slightly overripe stone fruit. Palate: Thick mix of chocolate and coffee at the front, followed by slightly edgy brown spices. Tobacco (a very heavy cigar). Heavily roasted nuts, and the residue in the edges of the bottom of a muffin pan. Finish: The tobacco, chocolate, coffee, and almonds stand out. There's something that reminds me of bitter fermented fruit (like an orange peel), but I can't quite put my finger on it. I respect this and enjoyed it. Perhaps new and interesting things stand out more, as I thought more highly of it at first pour, but I cooled to it slightly over tastings. Still, I think that it's very good - the cost seemed to me to be rather high to the quality, but not the experience, which is unique. Palate: large doses of cocoa, high cocoa content dark chocolate, sweetness that is like simple syrup made from dark brown sugurs, some slight note of green apple fruitiness. Finish: Becomes quite dry on bitter-sweet chocolate and that slight fruity tang. -Made from malted barley with a portion of 'chocolate malt' in the mix. Reminds me of dark chocolate more then any other whisky, it is a very distinct malt. Also comes in a bottle that asks to be mounted on a shelf, very nice. 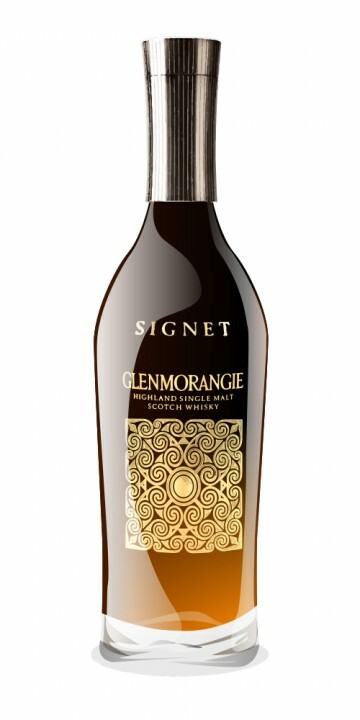 The Glenmorangie Signet is the pièce de resistance from this distillery (at least, for Joe Sixpack like you and me). It is their ultimate dram, created by Rachel Barrie, under supervision of Dr Bill Lumsden. It is a mix of 20% so-called ‘chocolate malt’ (used for brewing stout beer) and 80% ‘crystal malt’, being roasted barley (like Bushmills uses in the highly acclaimed 1608 Anniversary Blend). It is also a vatting of different cask types – sherry, bourbon and wine, but also Ozark virgin oak. And despite the absence of an age on the label, we have been there is even 35 year old whisky in the mix. Ooh, I’m curious. The nose is surprisingly perfumed. There are clear sherry elements (raisins, orange marmalade, cherries), as well as the typical spiciness of new oak (ginger, cloves) and bourbon traits (vanilla, honey). But there is something underneath that reminds me of after shave (or is that the shape of the bottle playing games with my mind?). And chocolate. And roasted nuts. And Arabica coffee. And candlewax. And, and, and. This goes on for quite a while. Very complex and simply delicious. On the palate, it is the wine influence that hits you first, immediately followed by very sweet honey, vanilla, oranges, Christmas cake, Turkish Delight and chocolate. Midpalate, the spices return. Slightly oily. The oak takes things to the next level in this long and drying finish. Tannins and nutmeg until the bitter end. The nose was enchanting, the palate fine and the finish more or less okay. All in all a beautiful whisky and the best Glenmorangie I have tasted to date (on par with the Astar). This dram deluxe will take a serious bit out of your whisky budget though, considering the cost of 140 EUR. Rachel Barrie clearly knows what she is doing (which is why I was happy to learn that she joined Morrison-Bowmore Distillers in October 2011, meaning many good things to look forward to from my favourite distillery). Well, where to start with this "oddity" ? Heathrow Terminal 5 to be precise, where I sit now, in First Class splendour, the sumptuousness of the surroundings blending with the opulence of the whisky. Its a lot cheaper here too (to buy the whisky). Glenmorangie have certainly stretched many flavour and balance envelopes in their impressively diverse whisky range. This one has strong caramel, chocolate and figs in the nose, and the smoothness and unctuousness of the taste are remarkable. Not for all tastes, for all palates of course. Too rich and hedonistic for say the Swedes, who thrive more on more astringent qualities, of pith and peat (and mighty fine they can be too of course). This frankly is more a aged brandy than a fiery whisky, but, it only goes to show, if show it be needed to do, how remarkably diverse and contrasting the world of whisky can be. Explore it, let your inner child go, indulge your fetid fantasies, your toothsome tantelisations, and embrace this bombastic bastion of braggadocio. This is possibly the finest whisky in my entire collection. I adore this stuff. "Oddity" is a good word for it. I use it for special occasions and special guests. It's on my top shelf in the center. Fantastic stuff and not too terribly high priced for what it is. Cool bottle too. I can never tell how much is left. Signet is a mixture of different types of malt. It uses some 20% of ‘chocolate malt’ (normally used to produce stout beer) and roasted barley which is dried at a higher temperature and roasted to a higher degree. It’s also a mixture of different ages (up to 35 years old) and cask types (refill bourbon, ‘virgin’ new oak, sherry oak and wine barrels). It comes in a beautiful bottle that’s smoked at the top and gradually transparent towards the bottom. The lid of the box also serves as a plinth. Nose: complex and perfumy. Reminds me of aftershave in a way. Armani Signet? Rather oaky. There are indications of oloroso casks (marmalade, raisins, chocolate), but also of new oak and bourbon (ginger, cinnamon). Hints of smoke, toasted bread and roasted coffee. Even some old glue. Very interesting. Mouth: rich, with fruit cake, vanilla and chocolate. Lots of ginger and nutmeg and again some roasted flavours. Hints of tobacco. Walnut oil. Finish: the wood is taking over, nutmeg again. Rather tannic. Spicy Mexican chocolate with a hint of lime. Very different in style. It had to grow on me, but in the end I was really convinced of its qualities. Bonus point for the innovation. ...and an 86 from WhiskyNotes is a pretty decent score! With my recent (good) impression of the current Glenmorangie range, and the way they are prepared to take a few risks and try a lot of experimentation to come up with unique new bottlings, naturally the flagship dram, the Signet, has been on my radar for a while. Nearly a year ago when I last visited my usual purchasing place in person (I buy online), the gents behind the counter said it was one of the few drams in the price range that is actually worth the money. Still, at around $275 a bottle, it was always something that I wanted, but I could never bring myself to fork out the money for. So when I noticed a $100 off sale on the Signet in their newsletter I decided (with permission from the boss, my wife) to take the plunge! Apparently this is the result of several years of experimentation. According to various sources around the traps, a portion of the whisky is made from 'chocolate malt,' which is industry speak for malt that is kilned at a higher temperature. This is supposed to increase complexity, and emphasise caramel and vanilla notes. Most often it is used in mild dark ales and stouts that have a sweet edge. It also has some Cardboll barley malt in it, which is said to result in a creaminess. Matured in ex-Oloroso sherry casks and new lightly toasted Ozark American oak casks with no age statement. And while some of it is no doubt quite young, there are rumours that it contains some barrels that are up to 35 years old! Blurb aside, on to the tasting! The nose is thick, rich and luscious. Full of rich, dark chocolate, ground coffee beans, christmas cake, robust sherry, chunky marmalade. Hints of scotch finger biscuits, oak and cream. Cinnamon? Pears? A floral note? Oh wow! Really complex! The taste is both creamy and syrupy. Really thick and mouth-filling. This whisky has texture! I don't normally take a lot of notice about how the whisky feels (as in the sensation of how it feels against the inside of my mouth), but this feels really luscious. Tastes of orange, chocolate, lightly roasted coffee, cinnamon, caramel and oak. It has a nuttiness to it as well. Hard to pin down, and takes several sips to get all the flavours, and it's not just the complexity, but the feel of the whisky keeps distracting me (in a good way)! The finish is long, and spicier than the nose or the taste. The sweet chocolate, marmalade and nuttiness are there, but the sweet cinnamon has put its foot down and made its presence felt, giving this a tingly warmness that keeps the finish going for ages. This is a bit out there, and very different. It must have taken a lot of attempts to get this to the point it's at. This feels like a whisky that has been tweaked, prodded and primped to within an inch of it's life, like a real show pony. But what a show pony it is! So, yet another whisky coming out of Glenmorangie at the moment has impressed me! It's amazing what can happen when a large distillery is prepared to put some time effort and resources into experimentation with nearly every part of the process they use to make whisky! Hear, Hear JD! I would be able to get immersed into the SMSW's much more easily/quickly if sample size or partial sized bottles were more readily available. In Ontario, the only 50 mL (single serving) SMSW is Glenlivet 12 ($4). After that you get to the 200 mL 'gift pack' style bottles. The only ones that fit that category are Cragganmore 12, Talisker 10 ($22 each), Oban 14 ($30) and Lagavulin 16 ($34). 375 mL bottles of Glenlivet 12 ($24) and Glenfiddich ($25) finish off the options for partial bottle products. I guess it basically boils down to the mass producers (the Glens) being able to use a smaller bottle (I'm assuming the smaller bottles increase production costs) due to their market dominance, and Diageo having the marketing intelligence and financial clout to offer their product at an entry level price so that people can sample product (and potentially get hooked) in a much more accessible manner. I'm still trying to figure out which, if any bars/restaurants in my area have a half decent SMSW selection. A couple have a handful of options, but most have the two Glens and not much else...sigh. @LeFrog - The bottle and packaging are a lot of fun to look at, and they include a little flip picture booklet full of marketing speak (which irritated me a little, I like info, not mumbo-jumbo about how spiritual a whisky is), but yes, it looks very nice on the shelf! @Victor - it is a very powerful and unique whisky - I can see some people not liking this as much as I have, because it is so different to pretty much everything else. If you like them big and sweet, and your palate doesn't mind something a bit different, you will like this one - a lot! @Dellnola - I'll give out a couple of drams to friends, and plan on selfishly keeping the rest of the bottle for myself! WOW! I had Glenmorangie Signet last week and if that isn't the HOPE DIAMOND of Scotch whisky --- then I'm a monkey. I couldn't follow it up with anything other than the same, as they would be slightly cubic zirconium-like in comparison! AWESOME - You HAVE to try this if you haven't already! RE: tasting notes I am not sure if that is necessary - I definitely got the gist of her experience. The only thinks I want to know are smokey or not and sweet or dry. There are a few other insights that can be helpful but I am open to a completely new approach to describing the scotch experience (such as the Clynelish 14 I am now trying - the taste is AGGRESSIVE - you will know you have tied into some moderately sweet - and somewhat darker sweetness - scoth Very much worth the $50 I paid. I have willing paid $110 for scotch that I am not entirely sure is that much better. OTOH - hitting more of the top rung, my recent experience with the The MacCallen 15 Oak Finish - so glad they added to the sherry bombs (no better way to describe them...). N: Complex, with aromas of fruit(oranges), honey, vanilla, oak, sherry and marmalade. And pepper as well. T: Very sweet, honey, oak and chocolate, also coffeeish and again the pepper! F: It's a rather long and exciting finish and I love it. I've had a bottle of Signet for a while. It's been opened but untasted. Finally tasted it last night. It is a seriously good Scotch. This is a Scotch to share with good friends who love great Scotch. I live in Alexandria, VA, USA. I got it across the Potomac in Montgomery County, Maryland, at one of their county-run liquor stores. It was $150 US plus 9% tax,for a total of $163.50 US. I am heading back to the county liquor store today to get a couple of bottles of the Glenmorangie Tusail. This is out of my price range but I had a dram at a tasting a while back and agree, this is seriously good stuff. The chocolate hit is sensational and the finish long and lovely. I had a small window to sample one whisky at a friend's store recently and this was the one I wanted. This brand was my "gateway" to the world of malt, so it was a pilgrimage of sorts. Being a Macallan and Highland Park fan,I find myself searching out that bold flavour profile and occasionally find some whiskies to be "understated" but this fit the bill. It didn't come across as a flavour bomb, rather it was confident, warming and in absolute harmony with all of its internal elements. I will be taking a bottle over to Vancouver Island to share with a friend who owns a craft brewery (it's not available in BC) and we can try it along with some fine chocolate malt-based ales.